I’m missing all the sports! 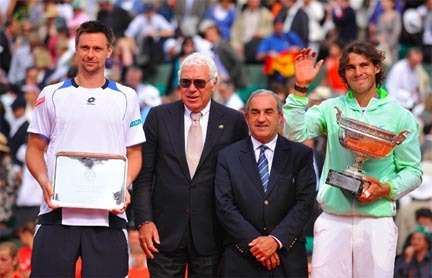 Rafa took his 5th French Open title yesterday, very happy he’s back in top form. Poor guy’s been plagued with injuries since last year. At 24, it’s pretty shocking. As a top tennis player, I guess it’s not that shocking and that’s the price of amazingness. Was a bit worried Soderling would muscle through with his aces. Anyway, that’s done. Wish I had seen the match but also relieved otherwise I’d have gotten nothing done. I forgot to stock up on beer anyway. I’ll have to do that sometime this week BECAUSE THE KICKOFF IS IN 4 DAYS I’M SO EXCITED! From a design (and personal, really) standpoint, these two images should really be the same height but I can’t be bothered to resize. 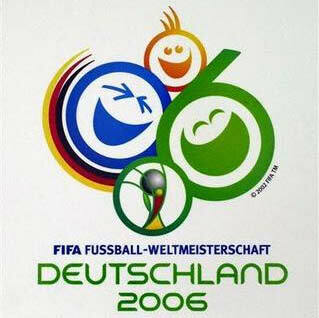 But yeah design-wise, the logo for the World Cup 2006 looks heaps better. Looks more cohesive. The guy on the left in the SA logo doesn’t seem to have any purpose as to why he is shaped that way. Unless his torso is meant to be a laughing face because he’s so happy. There’s certainly a lot of elements to work with which would be hell (maybe I’ll try my hand at it and see just how hard it is!!) but the previous logo just works it all a bit better. In this year’s logo, I don’t like how the type is busy and quirky and the image is busy and quirky too. I’m guessing that whoever designed this isn’t South African, s/he might be a football fan but it looks and feels too much like what MIGHT represent the spirit of South Africa, which I doubt is accurate. OR s/he is South African but isn’t a designer. It’s got to be one or the other. I also dunno why the word Africa is in red. It’s unfortunate that the national flag has way too many colours going on, but I understand that they had to go on the design. Thinking about it now, it’s really not a problem that’s impossible to solve, definitely challenging but not impossible. It seems they get free reign on using the mandatory elements anyway so it’s a workable design problem. Plus they had time to work on it, there’s no excuse. I dunno. The concept may have been brilliant but it just got lost in the execution. But everyone’s a critic. Meanwhile my poster design still needs its 3 concepts huhu. Presentation tomorrow!! I have 2 now but they’re not solid yet and I haven’t scanned my thumbnails in. Because I have no thumbnails yet. ACK! I’ll do it on the train over, where I surprisingly get a LOT of conceptual work done. Must be the motion. Guess I’m skipping lunch tomorrow boo. This really should go on the design blog. Obviously I won’t be able to catch much of the first 2 weeks of matches (yeah right) because I’ve still got 3 weeks of projects left to do and I’ve got to be sensible (yeah right). But it’s good to be ready anyway. I have a lot of all-nighters ahead of me and it would be nice to have an army of strapping fit men running themselves sweaty and keeping me company. But of course it’s about the ball skillz man! GO ARGENTINA GO SOCCEROOS GO FRANCE (but this last one just quietly cos I have Irish friends who HATE the French team because of Henry’s hand of god goal in the qualifiers; I’m thinking hey that’s the way the ball bounces). I’m so going to die this month. Can’t wait! This entry was posted in Best news ever, Good to know, Melbourne, Sports. Bookmark the permalink.